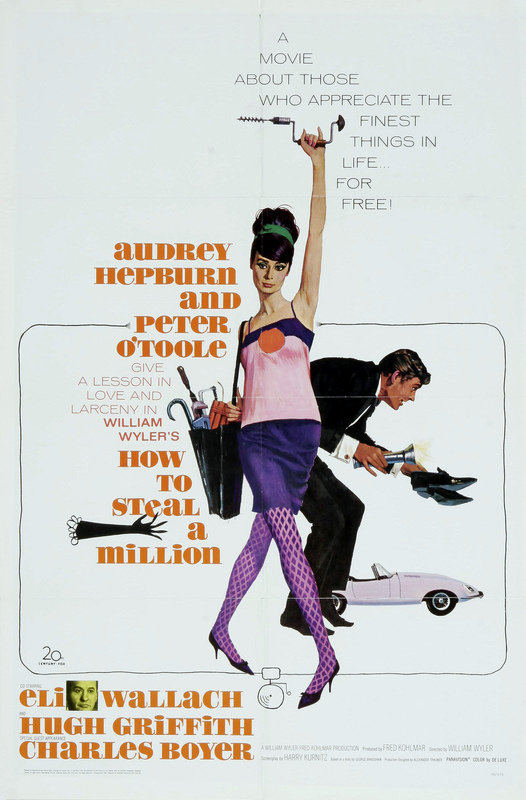 How to Steal a Million – Did You See That One? Nicole (Hepburn) is trying to steal a statue from one of the most secure places in Paris. The theft will help to protect her father’s (Griffith) work as an art forger from being discovered. Soon she partners with Simon Dermott (O’Toole) in her efforts to get the statue out of the museum. The two begin to find common ground as they plan their heist. This is a unique and entertaining romantic comedy based on the story written by George Bradshaw (The Bad and the Beautiful). The screenplay was written by Harry Kurnitz (Witness for the Prosecution). The film was directed by award-winning director William Wyler (Roman Holiday). The cast includes Audrey Hepburn (Charade), Peter O’Toole (The Last Emperor), Eli Wallach (The Holiday), and Hugh Griffith (Ben-Hur). The story for this movie is unique, entertaining, and endearing. The characters are written as a collection of larger-than-life figures. In a lot of ways they all seem to be exaggerated just enough to be memorable. The story is actually very simple, and there is little doubt as to the conclusion of the film. Still, this isn’t entirely predictable and the story works so well that it really doesn’t matter that much. The dialogue throughout the movie is also wonderful. It’s got a whimsical quality that’s hard not to enjoy. Overall, this is a pretty nicely written film. The acting in this movie is exactly what you’d expect from Hepburn, O’Toole, Wallach, and Griffith. Each of the stars took their character and made them unique. There is a playful feeling throughout the movie that comes from these great performances. The chemistry between Hepburn and O’Toole is also great. I wasn’t sure how much I’d enjoy O’Toole as a romantic lead since I’m more familiar with his dramatic performances. Thankfully he comes through with a fun role that doesn’t disappoint. This is also an interesting chance to see Eli Wallach do something different. He’s got a fun role that’s wildly different from his well-known bad guy roles. Finally, Hugh Griffith does an awesome job with the oddball role in this movie. Overall, this is a fun film that delivers great performances from the cast. The movie is pretty solid from the visual aspects of the production. The costuming work is excellent. Audrey Hepburn’s clothing just adds to her elegance. The movie uses the sets and locations nicely, making this a fun movie to watch. Thankfully, much of the movie was filmed in Paris, allowing the visuals to take advantage of that historic city. This is a fun romantic comedy that I think most people will enjoy. It does have a bit of the goofy characterization that a lot of films from the 1960s seemed to have. I would suggest this to fans of the stars for sure. I give this one 4.3 out of 5 stars. Never heard of this film, but looks like one I might enjoy. It didn’t win any major awards, but it was a huge hit when it came out. It’s a charming simple movie with some fun moments. Thanks for checking out the review.